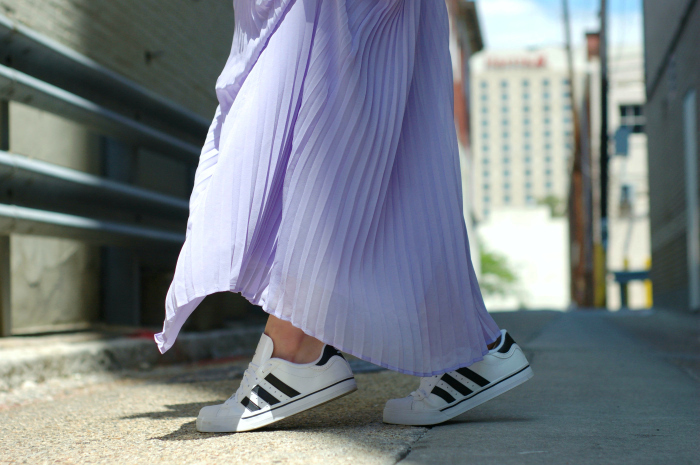 Just a few weeks ago I wore this pleated maxi dress to a local event, and paired it with heels and a tuxedo blazer. After that, I was hoping to find a way to make it a casual piece for summer. So I did what any style maven would do when they want to casualize (yes, I completely made up that word) a dress- I threw on a pair of flats, or in this case a pair of sneakers, and replaced that blazer with a leather jacket. Well, it is Sunday after all, and I am all about keeping things simple on a day that is supposed to be dedicated to rest. You look like a dream! I love this pastel lilac on you!! LOVE this whole look!!! I can’t believe this dress is from VS. I freaking adore it! So stunning! Love the dress, you look incredible as always! Truly magnificent. This color is so beautiful and love the girly vibe paired with the sneakers and leather jacket – just amazing look!! Great style switch Miranda…..and looking so chic as ever!!! gotta love a dress you can dress up or down, what a fabulously versatile piece! I absolutely adore this look… that romantic dress is pure perfection! This colour looks so great on you ! There’s something that is so refreshing and bright, love it! I was mesmerized by the backdrop and the vibrant color of your dress. You are truly one creative lady. Love this outfit! Have a fabulous day gorgeous!